Much has happened over the last year in terms of driving collaborative working to address the health inequalities faced by those within the criminal justice system. So it is timely to reflect on these achievements from a health perspective and look at what else needs to be done to improve health and reduce offending for people in detained and secure settings. As part of this, it is important to understand that whilst the relationship between health and social influences on offending and re-offending behaviour is complex, in some areas there is a clear link with health issues offering the prospect of reducing offending and re-offending rates through health related interventions. This is evidenced by the distinct set of health needs faced by those in or at risk of being in secure and detained settings, whereby they experience a disproportionately higher burden of illness, poorer access to treatment and prevention programmes, and problems with substance misuse. Furthermore, health concerns are often complicated by social issues, such as homelessness, unemployment and poor levels of education; and there is a growing cohort of older prisoners whose health and social care needs are increasing. From an NHS England perspective we have made significant progress on commissioning consistent standards of care across the secure environment – a must for delivering improvements and central to driving evidence based and outcome focused access to health services. In support of this, we have developed new specifications for mental health and substance misuse services in secure premises, as well as an improved screening process that is being rolled out across the system. With regard to improving mental health service provision, we are revising secure hospital transfer guidance and are contributing to the review of the Mental Health Act, ensuring the mental health needs of those in detained settings are not overlooked. In addition, the National Liaison and Diversion programme continues its roll out and is on track for 100% coverage by 2020. As part of this, we are working with partner organisations to deliver a peer support model, an enhanced Crown Court service and a women’s care pathway. To address the issue of a disproportionately high number of people within the secure setting having infectious diseases, work is also underway with partner organisations to eliminate Hepatitis C amongst this patient cohort and prepare for and manage pandemic outbreaks. Mindful of the particular complexities facing children and young people within this environment, action is being taken to ensure that they are appropriately supported. The aim is that they leave custody healthier than on arrival and those gains made during a child’s time in a secure setting are not lost. Building on this, significant investment has been made in mental health services, along with delivery of the Secure Stairs programme, which is an integrated care framework that addresses the health needs of this patient group. This is being delivered through joint localised health service provision and partnership work, with a focus on safeguarding and minimising deaths in custody and near misses. From an older person’s perspective, we have adopted a joint approach to managing their healthcare and the Dying Well in Custody Charter is scheduled for publication this spring. In respect of health services for women in prisons, development of improved health pathways is well underway and NHS England is working with Her Majesty’s Prison and Probation Service (HMPPS) to support gender targeted best practice to drive improvements in the experience of women. HMPPS has also ensured that all women’s prisons work to the principles of delivering services across a trauma-informed environment. In the spirit of the Rebalancing Act principles, NHS England has delivered regional prison health summits, bringing together governors, health commissioners and health providers for women’s prisons to support the sharing of best practice, provide a platform for consideration as to how regional resources could be used to improve health outcomes and develop innovations in services for women across relevant establishments. As NHS England continues its work in this area, central to all developments is the voice of people with lived experience. Their involvement and views are vital in ensuring that we are delivering patient centred care and, in doing so, are held to account for the decisions we make. We will continue to work with them and key partners to deliver on the commitments of the Rebalancing Act, with future initiatives including the publication of a national partnership agreement to drive further progress in this area; development of more health service specifications; and the roll out of a health and justice information system across the secure and detained estate to improve connectivity. Whilst many improvements have been made, there is still more to achieve, emphasising the importance of the Rebalancing Act in supporting stakeholders at local, regional and national levels to work together, learn by doing and ultimately be greater than the sum of our parts. The Rebalancing Act, is a resource published by the Revolving Doors Agency, with support from NHS England, Public Health England and the Home Office. To find out more about its progress, visit the Revolving Doors website. Kate Davies, OBE, is NHS England’s Director of Health & Justice, Armed Forces and Sexual Assault Services Commissioning. As such she oversees three areas of direct commissioning services across England for healthcare for serving personnel and their families and veterans’ mental health and prosthetics; sexual assault referral centres (SARCs); health and justice healthcare services in prisons, secure children’s homes and training centres, immigration removal centres; and the development of the national liaison and diversion programme and street triage. This national role is to assure quality, consistent and sustained services with a strong focus on health inequalities and outcomes for patients and their families. Kate has developed and led the national partnership agreement between the Ministry of Defence for Armed Forces commissioning, Ministry of Justice for prisons and children and secure settings and the Home Office for immigration removal centres. 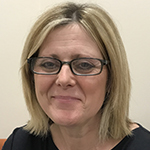 Previously, Kate was the Executive Lead for Prison, Detainee and SARCs Healthcare Commissioning for East Midlands and led the healthcare commissioning for prison and offender health. From December 1995 to May 2009, Kate was the Strategic Director of the award winning Nottinghamshire County Drug and Alcohol Action Team, co-ordinating and delivering the government’s national drug strategy. From 2003 to 2010, Kate was also seconded to the University of Central Lancashire, International School for Communities Rights and Inclusion as Director of Black and Ethnic Minority Community Engagement, focussing on the health and social care of diverse groups who experience discrimination and/or disadvantage and directing the national community engagement programme. Kate has been a Non-Executive Director on the National Treatment Agency Board in England between 2000 and 2013. She was also a member of the government’s Independent Board for the Prison Drug Treatment Strategy Patel Review, which implemented the substance treatment service and strategy and delivery across England and acted as an Ambassador for Diversity in Public Appointments for the government Public Appointments Commission. Kate worked in the probation service and was a qualified Probation Officer from 1986 to 1995, before joining the NHS. She was awarded an OBE in 2009, for services for ‘work with disadvantaged people’.